It’s the weekend and I hope you’re heading to a farmers market. The best ones are always on the weekends. Lots of farmers and variety, as well as crowds, but if you arrive early you can avoid them and get the best selection. Here are a few tips for shopping at the farmers market this weekend. Hold your cash in one hand and the food in the other. I use this trick all the time. As a regular at the market I know exactly what I want and I usually know the farmer. But that doesn’t give me any special privileges. I have to wait in line with everybody else and sometimes that can take forever. A new person asking lots of questions or ten people in line. But if you walk up to the front and show your cash and food – you can skip the line. I know it’s cutting in line and a cheat, but with exact change you can complete the transaction in second. And with the growing crowds of people at the market it can be needed to get in and out quickly. 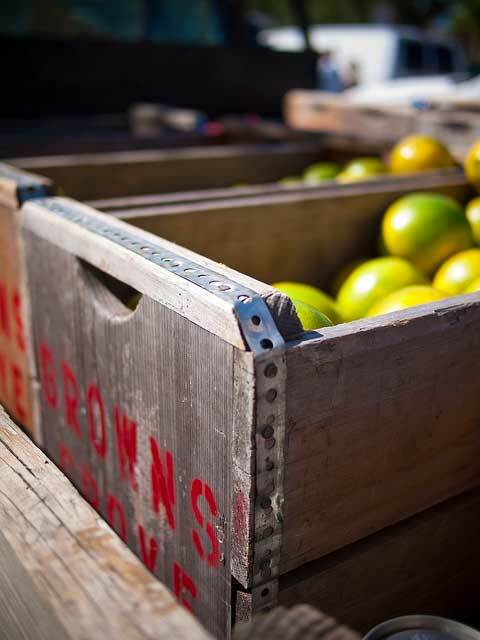 Save everything you get from the market, from little ties and rubber bands, to fruit and egg boxes. You can return all of them for a smile and nod of appreciation. Look closely at every market and you will see this happening. Someone returning a collection of thirty rubber bands or another with 5 empty egg cartons. It’s the sustainable side to the market. And the farmers love it because it saves them a few dollars on supplies. Look for the special item at every table. I’ve learned a secret about farmers that I can share with you. Each one has several products that are their specialty. They grow lots of them and have great variety – their staple crops. But they also like to experiment, grow something new, or cook something different. Usually just a small amount to see if it sells or for their own family. Which means they quickly sell out, but if you can find one, take a look. It’s usually exotic or rare and you probably won’t know what to do with it, but it’s always a treat. Finally, a quick story about one of my experiences. A few years back, I found a farmer with a single walnut tree in his yard. His father had planted it 40 years ago so his family could have walnuts, but now it was so big they couldn’t eat all the fallen walnuts. So he began selling a few of them at the market for dirt cheap prices, but he always placed them in the corner and sometimes didn’t even put them out. I learned all this as I began buying from him, and they were delicious. The best walnuts I ever had. Soon my girlfriend was eating them and I was buying double. Some weeks I would walk up with a huge bag and buy every single walnut he had. At this point he realized walnuts could sell and gave them more table space with a big sign. To my chagrin, they did sell and I was now fighting other market shoppers for walnuts. Some weeks I would get some and others not. The price went up a little, but every time he saw me I would get a discount and a smile. Do you have a tip or story, please share in the comments?